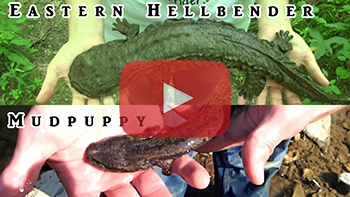 Is it a Hellbender or a Mudpuppy? One of the main problems facing eastern hellbender (Cryptobranchus alleganiensis) conservation is that many people mistake this endangered salamander for another common species called a mudpuppy (Necturus maculosus). Conservationists and researchers encourage any outdoor enthusiasts to report eastern hellbender sightings by going to helpthehellbender.org​ or by reporting to a conservation officer. Unfortunately, many hellbender sightings are actually mudpuppy sightings. This can cause confusion in conservation efforts, so the need for public education on hellbender identification is strong. Check out the “Easteren Hellbender ID Video” to learn more, and Help the Hellbender’s website, Facebook page, and Twitterto stay current in hellbender conservation. Help the Hellbender Day at Columbian Park Zoo a Great Success – Got Nature? Thank you for your comment and for sharing our web site! We will continue posting current resources to share with our visitors and if you have any topics or issues you would like our experts to follow up on, feel free to use our form “Ask An Expert”. Thank you again!